It may not surprise you that everyone at GSC loves their job. Every day is a pleasure, but –all that considered – every now and again something still comes along that absolutely blows our mind. Once in a while, we stop pretending to work and just sit back, amazed at the events unfolding before us. For me, that moment – quite fitting for World Theatre Day – came today at St John’s Primary School in Woking. 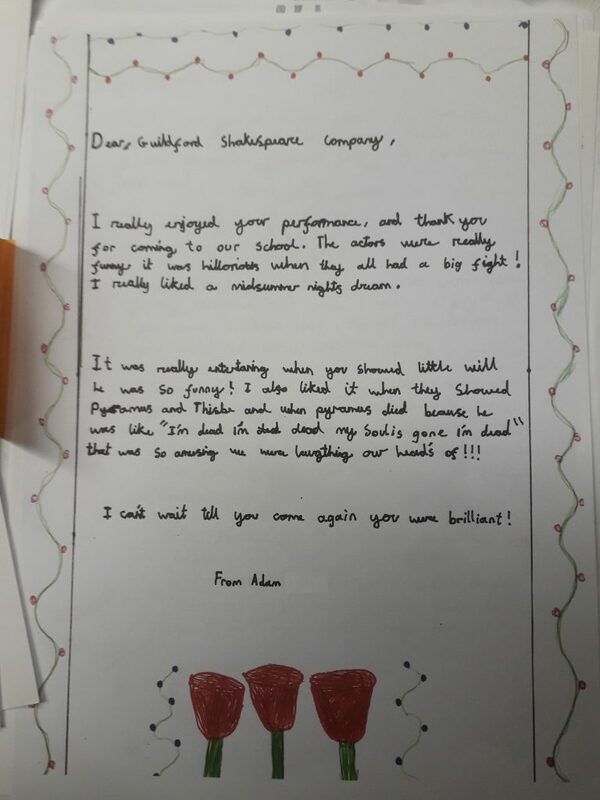 We first worked with St John’s in February, when they joined the Delight in Shakespeare programme for the first time. We performed A Midsummer Night’s Dream in their school hall and over the next few weeks, the cast returned to help them stage their own production for the school and their families. Skip ahead to this afternoon and we took a road trip down winding Surrey roads to their school buildings. We signed in at the front desk and took a seat at the back of their school hall. Our actors had suggested that this school performance was going to be worth visiting, but nothing could prepare us for the performance we saw. Without a doubt, I have never watched such a confident and talented bunch of school children. I have never seen dialogue so polished, or a performance full of such energy. Not a single moment was lost, or an idea wasted; whether it was Theseus terrifying us with the idea of paperwork, Lysander and Demetrius’ boxing match, the spontaneous dance sequences to ‘All The Single Ladies’ and Bottom’s song – “I have long ears now / and I didn’t used to like carrots / but now I do.” I laughed until my eyes wept. What’s that I heard someone say? Shakespeare is inaccessible? Well, I beg to differ. These children launched themselves into one of Shakespeare’s most complicated plots and reshaped it into something glorious. It just goes to show what amazing work children can produce when they’re given the freedom to be creative. Speaking to the staff and parents afterwards, it’s clear that the benefits of the project weren’t just contained to the rehearsal room, either. The children have been more confident and sociable, chatting to their parents about their day and engaged in school. Their attendance has been exemplary since the project began and it’s not hard to see why. I love what I do and I skip to work, so why shouldn’t they skip to school, if they love what they do. Thank you Susan. It has been a wonderful experience working with St John’s, and all the schools involved in our 4th Delight in Shakespeare tour. It really demonstrates the transformative role the arts can make in our schools and curriculum, to both pupils and teachers. A vital resource that needs to be sustained.